Corey Graham (with Malcolm Jenkins, background) is a late arrival to Eagles training camp. Turns out, it wasn't so much the Eagles making a decision about bringing Corey Graham back as it was Corey Graham making a decision to play. 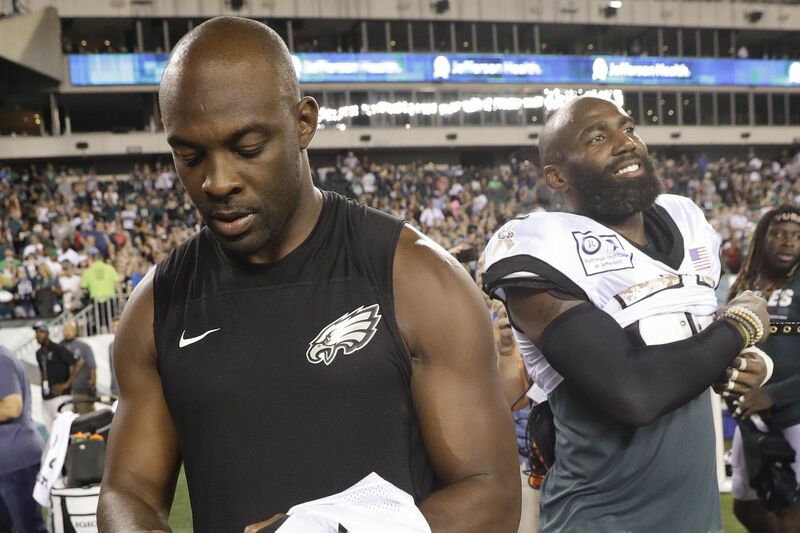 Graham, a backup safety who became a free agent after playing 84 percent of the snaps in Super Bowl LII, turned 33 on July 25, the day Eagles players reported. He said Sunday that he understood he was welcome to return whenever he was ready. Now, he's ready. Graham signed a one-year contract, then practiced Sunday night, taking flak from teammates over his late arrival. Will Eagles’ Darren Sproles make the Hall of Fame? "I knew if I did decide to play again, it would be here. I wasn't going to go anywhere else," said Graham, who has played 10 seasons, winning Super Bowl rings with the Ravens and the Eagles. "I love everything about it here. … I missed the guys." Until they signed Graham (and released undrafted rookie safety Ryan Neal) the Eagles didn't have a backup safety who had played in an NFL game. Tre Sullivan, a practice squad member last season, has garnered praise from teammates and coaches, but all along the question has been how comfortable the defending champs would be without any experience behind Malcolm Jenkins and Rodney McLeod. Safety is a cerebral position, one that requires signal-calling and an ability to quickly assess what the offense is doing. That's tough for guys who haven't played in the league, even if they have all the tools. "It was closer than people think," Graham said, when asked about retirement. "All the players, they're just like, 'We were just waiting for you to come back.' They just assumed I was going to come back. Being home with my family … they wanted me there, I enjoyed it, so it definitely was close. What it all came down to was another opportunity to try to win again, another opportunity to be around the guys. … When it was all said and done, I wanted to be here again." Graham said he assumes this is his final season. "If I say anything else, my wife might kill me," he said. Jeffrey Lurie spoke with reporters Sunday evening about the contract extensions through 2022 for Howie Roseman and Doug Pederson. Lurie, still hyped from Brian Dawkins' Hall of Fame induction ceremony Saturday night, began his remarks by extolling Dawkins. "Awesome experience. … It was really an emotional weekend, celebrating who he is as a person and as a Hall of Fame player. His speech was so 'Dawk,' it was vulnerable, passionate, genuine, honest – it's what makes him a great person, but also made him a great football player," Lurie said. "It was amazing to have so many of our [former] players there – of course, coach Andy Reid and Donovan [McNabb] and Brian Westbrook … [Jeremiah] Trotter and all of those guys." Lurie also noted what TV cameras seemed to show — that the Eagles had the largest, most raucous group of fans in Canton, Ohio. "Eagles fans dominated. … It felt like there were more Eagles fans there than all the other teams put together." The Eagles said they welcomed more than 40,000 fans to Lincoln Financial Field on Sunday night for their public training camp practice, which was ticketed but free. It was the first Linc appearance for the team since it won the Super Bowl. The last time the players took this field, it was on Jan. 21 in the NFC championship game obliteration of Minnesota. Several regulars took the evening off. Wide receiver Mike Wallace left with athletic trainers, but when Wallace returned after practice for the jersey exchange with members of the military, he was walking normally and seemed in good spirits. He had an ice pack on his right knee. Tight end Adam Zaruba was waived/injured, replaced by Gannon Sinclair.